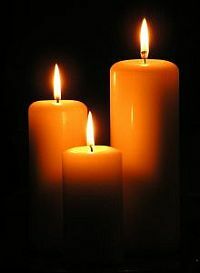 Since Candle Fire Safety Week is wrapping up (runs from November 14-20), I thought I’d include a few safety reminders. Feel free to add your own. 1. Never leave a burning candle unattended. This means if you feel sleepy, remember to blow it out before you nod off. Also, if you’re in a hurry to leave, make sure you check to make sure you’ve left no candles lit. 2. Keep candles away from pets and children. Both of them tend to knock things over or will try to touch hot dangerous things out of curiosity. Once, my cat walked across our wall unit and fanned her tail right across my lit candle! A lantern would have been a better bet because it’s encased. Battery operated candles are even safer. 3. Keep candles away from things that could cause a fire. Besides the obvious things like papers and curtains, be aware of nearby baskets, plastics or furniture. Sometimes, the flame flickers higher than you imagined it could. 4. If the flame on your candle gets too high, blow it out! This is a sign that your wick needs trimmed to a ¼ inch and/or there’s too much of a draft in the room. Check your fire alarms regularly fellow candle lovers, and stay safe!